We’ve taken a good look at cargo bicycles in the last few posts and I think it’s clear that we think they are pretty great! A cargo bike is versatile, practical, affordable, economical, fun and a whole bunch of other great things. But, even knowing all that, we understand that a cargo bike isn’t for everyone. Maybe you lack the storage space for a larger bike. Maybe, as reasonably priced as cargo bikes are, it’s still a big chunk of money to hand out all at once. Or maybe you just don’t do a whole lot of cargo hauling. After all, I’ve seen many people purchase a pickup truck because they need to take an occasional large load here or there. As practical as that might sound, the reality is, if you don’t use all that cargo space regularly, you’re better of buying a car and and installing a trailer hitch and buying a trailer for the rare occasion when you need to haul things around. You’ll not only save on the initial cost of the truck but all the extra gas money you’d spend driving an empty truck around town. The same applies to cargo bikes. They are certainly great but if you’re not going to be using the extra hauling capacity on a regular basis, it might not make a whole lot of sense. But you DO need to haul things once in awhile. Maybe you commute to work five days a week and do groceries on Saturday. I think it’s unrealistic to expect you to use a heavier and less manoeuvrable cargo bike for 80% of your bike outings that would be much more pleasant on a regular bike. 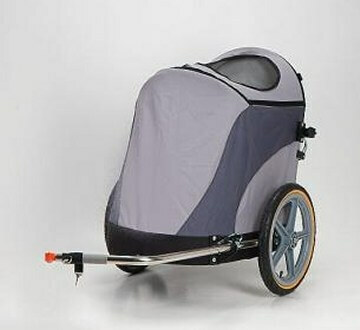 Enter, the bike cargo trailer! Whether you’re a weekend landscaper, a shopper, or someone that just needs to get a bunch of stuff from point A to point B once in awhile, there’s a bike cargo trailer for you. Wouldn’t it be great if we could eat out for every meal every single day? Well, maybe not so great for many people who like to cook but I’d bet there are lots of people who would gladly not cook at all. The reality is that unless we are obscenely wealthy we all need to get groceries at least occasionally. Even if we don’t eat at home we still need those sundries like shampoo and deodorant. And for that grand occasion of going to the grocery store, the shopping bike cargo trailer fits the bill. Unlike say, chile bike trailers, the shopping bike cargo trailer is usually designed to hold a lot of irregularly shaped items. Many will come with some for of protection for your groceries in case it rains or snows. The very best will double as a grocery cart but I know that at least a few places do not allow anything other than their own stock grocery carts in their stores. Two words here: big, strong. It’s very possible that you could use a cargo bike for the sizes of the loads you would likely carry if you are using your bike cargo trailer for landscaping. But there are certain advantages the trailer has over the bike. For example, you may use your bike to visit clients and zipping up on your bike might be easier. A landscape bike cargo trailer can also be detached and moved to hard to reach locations. Other advantages can include a drop gate and high canopy. I don’t image you’d want a large canopy blocking your view on a cargo bike! Lumber? No problem. Furniture? Also no problem. Gold bars? You might want to move quickly through town but again, no problem. If you routinely handle large loads, a heavy duty flatbed bike cargo trailer may be the way to go. These types of bike cargo trailers are usually built of much sturdier materials and wheels. The open concept means you can stack things much higher than in a traditional, closed bike trailer. Hauling garbage cans to the dump it a snap! 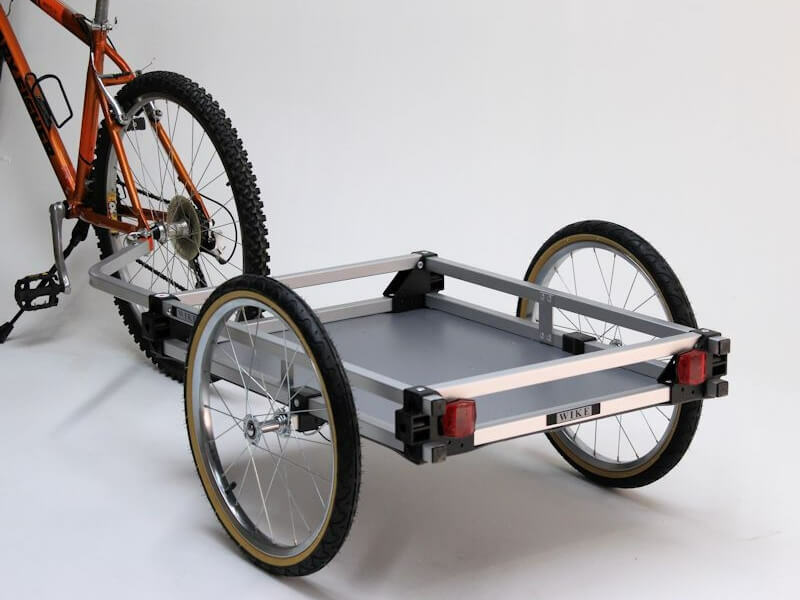 So if a cargo bike is not the perfect vehicle for you, consider a bike cargo trailer. You can keep the bike you love and extend bike usage into so many other parts of your life!